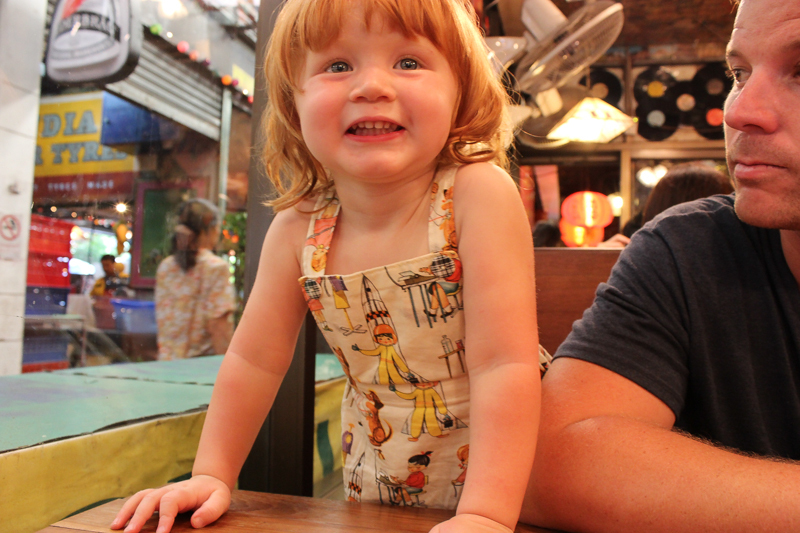 Lottie Cakes: Our final day in Thailand before our next destination. Here we have stopped in the middle of Chatuchak Markets in Bangkok for a bit of lunch and a cool breeze. It's three weeks into our journey and you seemed to have grown so much and if possible you are wilder than ever. We have spent our last Thai weekend in water parks on rooftops, in markets the size of my hometown and snuggling up for long naps in preparation of the next leg of our journey. You love the local food, thank the cab drivers in Thai with a tiny bow and run wild though the streets without a care. Your dad and I joke and envision you in 16 years time with your little backpack strapped on and doing this all again solo style. It is bittersweet for me thinking how that time will fly but knowing when it does come your wings will have fully grown and you will be more than ready.